Since then, I’ve had one more dramatic experience of what could be seen as inconsequential and felt triumphant in the moment. 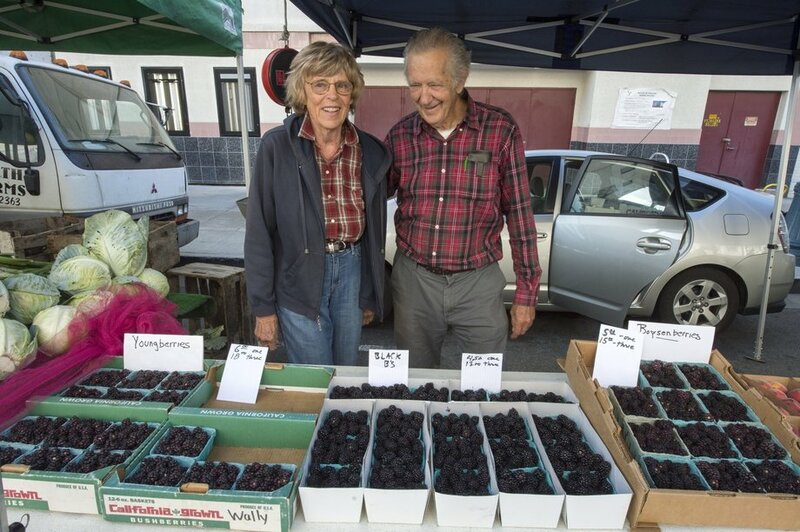 I was at the Berkeley Farmers’ Market, one of my favorite spots, a highlight of every week. It was the high season of mulberries, which only one farmer carries, of a particularly beautiful variety: they are long and slender, dark purple brown, striking to the eye. I indulge in them every year. Often I don’t even get home before I am done with the entire basket. Because I had them prominently displayed in my cart, so I can reach them and eat more and more, many people commented on them and asked about them. It’s one of the features of the market that I love so much: it’s a place where people shift somewhat out of the gray anonymity that we have accepted as a substitute for human community, and talk with each other freely. These are the same people that wouldn’t even look at each other in a supermarket, and here they chat. One woman was looking at the mulberries and speaking about them with such interest, that I was instantly moved to offer her one. She was visibly uncomfortable, and yet agreed, and pulled one of the smallest, least appealing ones in the bunch. I insisted on her having a really big, long, juicy one and gave it to her. We were standing in line at a food stall, so there was still time to chat. She ate it, and then said something about this is costing me dollars, and pulled out two dollar bills to give to me. I, of course, refused. Then she put them in my cart, much to my own unhappiness. So I took them, gave them back to her, and pleaded with her to keep the interaction what it was: a spontaneous gift I was offering her, without any exchange, without any expectation of something else. I could see she was struggling, and then she relented, and opened up to receive – both the original gift of the berry, and the additional gift of being invited into the gift economy future. In that moment, I knew, as with the dishwasher, that I was using all that I am and have to offer to bring about the change I want to see in the world. In addition to helping me make sense of experiences I am having and giving me guidance, this new understanding is also supporting me in having more peace and acceptance overall. There is something of a relief to have less helplessness about my role in the uncountable many acts that are done by so many of us in an attempt to make the future possible. Whoever I am with, that is the leverage I have in that moment towards that bright possibility. Whenever I follow that deep intuition and respond in my fullness, I am truly doing all that is humanly possible. Recently, a friend told me about a challenging experience he had when he went to a birthday party with his wife. He saw her move about the room, chat with people and exude warm, social energy, while he was stuck in a familiar and painful place, feeling awkward and not knowing what to do with himself. This was so painful, that he had a nightmare and woke up in panic the next morning. As he lay in bed, he was able to bring some perspective back, and successfully reminded himself that it’s his preference to engage with people deeply rather than a deficiency of his as he first experienced it. That released most of the intensity, and still he was wondering what to do with himself in those moments in which the kind of depth that he longs for is not exactly on the menu. In this moment in the conversation this recent insight about power came to my awareness, and we explored the implications for his situation. Because I imagine that the challenge he described is so familiar to many, I want to share the details of what we arrived at. First, it became clear that the most powerful thing he could do in such circumstances is to ask himself what he could do, moment by moment, to create as much meaning and depth as possible given the surroundings. We were happy to see that it could mean doing the “risky” behavior I often choose, which is to take casual conversations, even with strangers, and engage them to become deeper and more meaningful. In fact, for myself, I almost can’t help it. Whatever someone says, I almost invariably think of the questions that would take the conversation deeper. For my friend, this was not a response he had considered before, and yet he could immediately see that this was an option. We also recognized that sometimes the answer would be different, that meaning and depth would take him to sit on the sides and occupy himself with something else altogether. We noted the difference between disengaging and withdrawing, on the one hand, and choosing to focus elsewhere, which is far more empowered. Lastly, he noted to himself that asking that question can, in itself, feel like doing a lot of work. He wanted it to be a choice whether or not he would ask himself that question, whether or not he would engage with himself about what would bring depth and meaning. Then we concluded together: the more choice we give ourselves, the more powerful we can be in each moment. Click here to read the Questions about this post, and to join us to discuss them on a conference call next Tuesday, 5:30-7 pm Pacific time. This is a way that you can connect with me and others who read this blog.We are asking for $30 to join the call, on a gift economy basis: so pay more or less (or nothing) as you are able and willing. This entry was posted in Uncategorized and tagged Uncategorized on August 17 / 2013 by Miki.